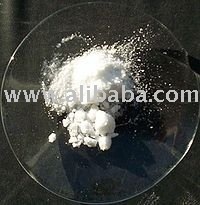 Ammonium chloride NH4Cl (also Sal ammoniac, salmiac, nushadir salt, sal armagnac, sal armoniac, salt armoniack) is, in its pure form, a clear white water-soluble crystalline salt of ammonia. The aqueous ammonium chloride solution is mildly acidic. Sal ammoniac is a name of natural, mineralogical form of ammonium chloride. The mineral is especially common on burning coal dumps (formed by condensation of coal-derived gases), but also on some volcanoes. The substance occurs naturally in volcanic regions, forming on volcanic rocks near fume-releasing vents. It is a by-product of the Solvay process used to produce sodium carbonate. Ammonium chloride is prepared commercially by reacting ammonia (NH3) with hydrogen chloride (HCl). As these chemicals are corrosive, this process has to be performed in vessels lined with nonreactive materials (e.g. glass, enamel, lead, or PVC). This reaction can occur if poorly sealed bottles of household ammonia (ammonium hydroxide) and hydrochloric acid are stored in close proximity, leading to crystals forming around the openings of the bottles (mostly appear on those leaking more slowly). Ammonium chloride appears to sublime but this process actually involves decomposition into ammonia and hydrogen chloride gas. If test tubes of ammonia solution and hydrochloric acid are brought close together, a smoke composed of microcrystal’s of ammonium chloride will slowly rise out of the tube. Ammonium chloride is used as an expectorant in cough medicine. Its expectorant action is caused by irritative action on the bronchial mucosa.